Ok, so along with my engine running rough I found a fairly substantial leak in the shaft packing nut today. Nice lil stream of water coming in. I tried to tighten the nut a bit but no go. One odd thing I noticed was a fairly substantial vibration at speeds just above idle and was wondering if this could be related to something with the shaft packing or if this may be engine related. I believe that there is either a fuel/injector and or spark issue going on right now and may be missing a cylinder. I noticed a fairly strong fuel smell and wonder if it may be a bunch of unburned fuel in at least one cylinder. Wish the engine diagnostic wasn't proprietary so I could hook up my OBDII scanner. 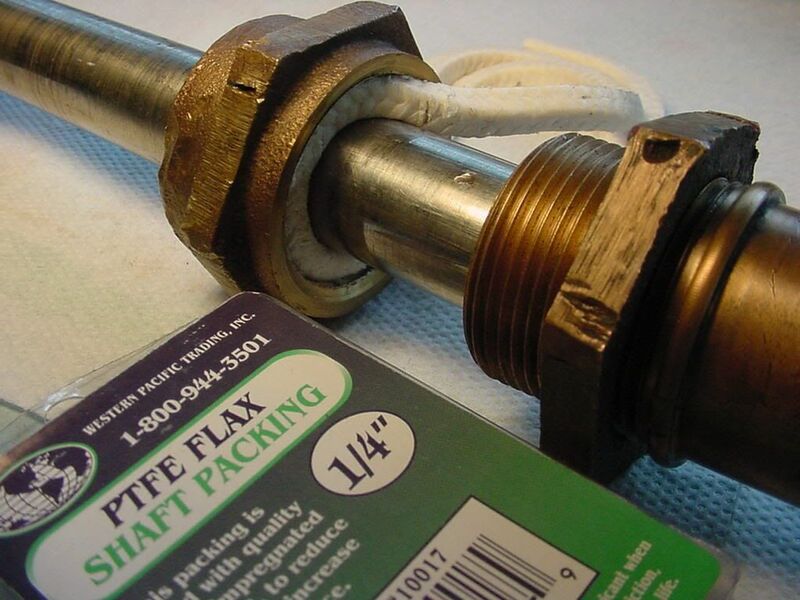 If tightening did not change the leak you will need to replace the packing. Not a big job if you have some maniacal skills. Two possibility's. Standard Wax rope. Or Gortex dripless. Or if you would like to get into it much more a permanent dripless seal. vibration? could be if your engine running rough, Ding or bent propeller, lose cupping. Hardest part of the shaft packing is getting your hands in there to dig out the old packing. If your motor is missing that will cause the vitration and fuel smell. Hook up your scanner and see what it says. Could just be cap androtor corrosion. Bent drive shaft? That could cause your packing to fail. That's one thing I considered. Not sure how it would have gotten bent though unless the guys loading it from the rack nailed it on something. I haven't had it on a trailer or really out since I winterized it. If I do find it's bent some fork lift guys will have some splainin to do. If it was the first dip of the year, it takes a little while to reswell the packing. Also your running gear would show some damage if it was smacked on something. Get a set of picks at harbor freight and replace your shaft packing. Ok, so along with my engine running rough I found a fairly substantial leak in the shaft packing nut today. Nice lil stream of water coming in. I tried to tighten the nut a bit but no go. your comment left just enough wiggle room that i have to ask...did you loosen the lock nut when you tried to tighten the packing nut? thought that the lock nut may not be easy to see on a vd. That's a big nope. Got on YouTube today and realized that it's two separate pieces. Duh. Live n learn. Tomorrow's visit to the marina will be to back off the lock nut and peek in to see if the packing is trash. I have a couple of picks to pull it out if it's garbage and will stop by West Marine or the Malibu Dealer to pick up some flax. I also found the manual that covered the engine idling troubleshooting step by step. I'm going to do the visual inspection of the plug wires and probably take off the distributor cap to inspect but I may have to pay the piper for the MEFI/OBD scan to narrow it down if I don't find anything. I really doubt you'll be able to peek in & see the packing. This is one of those things you do somewhat blind & just trust us that there is a packing inside there. Loosen the lock nut, completely unscrew the packing nut & it's in there. Use the picks to dig them out. There is usually 3 layers in there & they will come out separately. Then when it comes time to pack them back in, cut 3 pieces so each one wraps around the shaft & the ends just touch. Insert one piece, screw the packing nut on to press it into place. Then do the second piece, screw the packing nut in to press it in, then the 3rd layer. It'll be a tight fit & you may not be able to get the threads started after inserting the 3rd piece, which is why you pack the first two layers in first. I used the Goretex stuff from Skidim.com. Installed it about 4 or 5 yrs ago & haven't touched it since. I picked up a caliper also so I could get the right size flax. Noticed yours was 1/4" but not sure what mine will be. Guessing a 1" shaft but who knows what the inner diameter is of the nut. Also found an cheap adjustable straight wrench which I hope is big enough for the nut. Gotta love Harbor Freight. Getting two channel locks in there looks like no fun. Thanks for the tips. I have a small piece of pvc pipe that I cut up. I'll try to remember to take a picture of it this evening if I can find it. Basically cut about 3 inches of pipe that will fit snugly around the shaft. Then I use that to press the flax into the nut. You will definitely not see the flax in the nut. Grab a couple picks, one with a nice hook/curve at the tip will be very helpful. Then just dig them out. Once you get it broke loose you can grab the wax cord with a small set of needle nose pliers. Remember to off-set the new cords where the ends meet up for each wrap. And when you tighten it back up You won't need to tighten the packing nut a whole lot. I ended up going up for a couple hours to work on it this morning mostly due to the freeze here tonight. Drained all the water then worked on the shaft nut for a while. Had to use some WD40 (no PB Blaster and no time to buy it) but after much ado, a couple bloody knuckles, and some light cussing the nut broke free. I didn't have time to repack it but was able to at least get a handle on what I was doing. I'll likely go up later this week to do the packing. One other thing I happened to get to while I was up there was pulling ALL the plugs to take a look at the condition. Now, I'm not a plug guru but the two on either side of the block closest to the bow (technically rear of the engine) seemed to be a bit wet but not cruddy looking oil fouled. All the others were dry and in somewhat varying stages of carbon build up. I noted a very strong smell of fuel in the bilge and wonder if the two are related. Checked all of the plug wires for frays and didn't see anything. I'll likely pull the distributor cap on Friday as that's the next time I'll be up there. Check your distrabuter cap. Im guessing you have some corrosion on the contacts that is preventing the firing of the suspect plugs. Note they are NOT supposed to be white, that would be the corrosion.